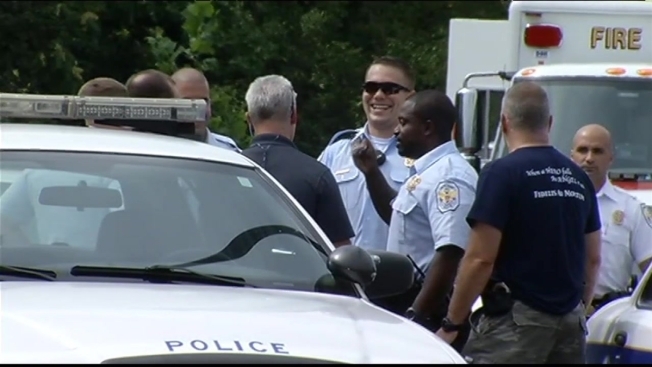 A police chase snaked through D.C. and Prince George's County Friday afternoon after a driver said a driver shot at him. The chase started about 2 p.m. after a man told U.S. Park Police officers on Suitland Parkway that his car had been shot, U.S. Park Police said. He was able to point out the vehicle and Park Police began its pursuit. Police followed the vehicle, a gold Lexus, on I-295, the Capital Beltway, parts of D.C., into Prince George's County, across the Wilson Bridge into Virginia and back across the bridge again. The chase ended about 2:45 p.m. in Prince George's County just north of the Beltway exit on southbound I-295. The driver of the Lexus, Leon Strom, 30, was arrested and hit with a felony charge of attempting to elude police, police said Friday night in an update. Police found a gun on the Wilson Bridge, the update said. The chase hit a maximum of about 55 mph on the Beltway, U.S. Park Police Lt. David Schlosser said. No crashes or injuries were reported. Police are seeking the public's help in locating the victim, who is believed to be driving a red sedan with bullet hole damage to the passenger-side front fender. Anyone with information on the incident is asked to call the U.S. Park Police Tipline at 202-610-8737 or email uspp_tipline@nps.gov.